Entering the Howling Fjord into Daggercap Bay. The Howling Fjord is a region located in southeastern Northrend. Ripped into the southern coastline lies Daggercap Bay. The majestic fortress known as Utgarde Keep is located in the center of this region; it is a dungeon complex and one of its sections is one of the two first instances (the other one being the Nexus) that players encounter when first arriving to Northrend. Howling Fjord contains bases of both factions and does not have a faction-specific emphasis. From the tuskarr settlement of Kamagua on the Isle of Spears, located off the southwestern coast, there is a giant turtle vessel able to transport players to Moa'ki Harbor in the Dragonblight and from there on to Unu'pe in the Borean Tundra. During the Third War, Prince Arthas Menethil of Lordaeron arrived with his soldiers to destroy the dreadlord Mal'Ganis and punish him for the plague of undeath unleashed in his homeland. Arthas and the dwarven explorer Muradin Bronzebeard joined forces against Mal'Ganis, who they thought to be the Lich King's lackey. When Arthas's father summoned him home again, the prince responded by hiring mercenaries to burn his own ships, and blaming only them for the act of treachery, thus forcing his men to stay and fight. He searched for and obtained the cursed blade Frostmourne in the nearby region of Dragonblight, mortally wounded Muradin in the process. He used Frostmourne to defeat Mal'Ganis but lost his soul to the Lich King as a result. Arthas then wandered for a time, losing his mind. When he returned to his camp, he slaughtered his followers and raised them as mindless Scourge and some as death knights. The nerubians also maintained a number of isolated outposts around Daggercap Bay by the time of Arthas's expedition to Northrend, and the ice trolls also had small settlements here. During the war against the Lich King, the settlers of Valgarde have to deal with newly reawakened vrykul warriors, who raid them from their home of Utgarde Keep. In addition, Ironforge prospectors have discovered a new race of iron dwarves which may hint to their own ancient origins. Finally, the Forsaken have settled here and engineered a new plague, ready to strike at the Lich King. Their main settlements are Vengeance Landing and the town of New Agamand, named after the famous mills family which once lived in the Tirisfal Glades. Map of the Howling Fjord. For the Alliance, there is a boat port connecting the town of Valgarde with Menethil Harbor in the Wetlands. For the Horde, a zeppelin connects the town of Vengeance Landing with the Undercity in Tirisfal Glades. The Howling Fjord will reputedly see several famous faces on the front against the Scourge, including Tirion Fordring, and the legendary weapon Ashbringer. There are well over 140 quests in the Howling Fjord. Players who are making the Fjord their first stop in Northrend had better be prepared to defend themselves. It is a zone riven by territorial disputes: In the east, the Alliance and the Horde continue their heated rivalry in an attempt to gain the coast. In the west, the Alliance is harried by the Northsea Freebooters. Running up the center of the land mass, both factions struggle with fiercely entrenched vrykul forces. Most of the major questlines are shared by Horde and Alliance, with only the quest NPCs and their locations being unique. This should produce elevated levels of conflict on PvP servers, as competition for quest mobs and target locations will be tight. Regardless of who they are, players should expect to gain notoriety in the tuskarr and pirate bands as dark spiritual influences become increasingly apparent. What secrets are held by the giant races of the land? Are they best left unrevealed? The Howling Fjord, located in the southwest of Northrend, is a great name for this place. They call it that because the wind races in from the sea on all three sides, producing a constant howl like a maddened beast seeking its prey. Most people who arrive in Valgarde purchase low, fur-lined caps with flaps for the ears, or headbands that slant down in back, or thick hoods, anything to keep their ears from ringing when outside. Other than the noise, the Howling Fjord is pleasant. It is not as heavily forested as the Grizzly Hills, or as hilly, but the temperature here is a little milder; between that and the flatter terrain it is an ideal place to grow grain and other crops. Small farms dot the landscape, particularly down south near Valgarde. To the north the trees begin again, and creatures roam there from the hills above, making it more dangerous but also an excellent place for hunters. The Howling Fjord has dark forests, open plains, treacherous rocks, and the only city — and port — on the continent. The last item in particular makes it an ideal place for Northrend adventures. The White Shark tribe of murlocs reside here. The Howling Fjord was a favorite on Northrend from the first time explorers reached the continent through Daggercap Bay. The natural harbor provided an ideal launching point for expeditions throughout the landmass. After the Lich King arrived, the Scourge swept across the continent, conquering its races and claiming many of the towns and citadels. During the Third War, Prince Arthas of Lordaeron arrived with soldiers to destroy the Lich King and punish him for the plague he had unleashed. Arthas and the noble Muradin Bronzebeard joined forces against the Lich King's ally, the dreadlord Mal'Ganis. When Arthas's father summoned him home again, the prince responded by burning his own ships, thus forcing his men to stay and fight. He obtained the cursed sword Frostmourne in this region, killing Muradin in the process, and defeated Mal'Ganis but lost his soul to the Lich King as a result. Arthas staggered away alone after the battle, and his men were left behind, stranded on Northrend. These humans and dwarves founded Valgarde. They also built the fortifications that protect it to this day. As Valgarde grew, its residents forced the Drakkari and furbolgs back into the Grizzly Hills and beyond, making the region safe enough for brave farmers to till the land. 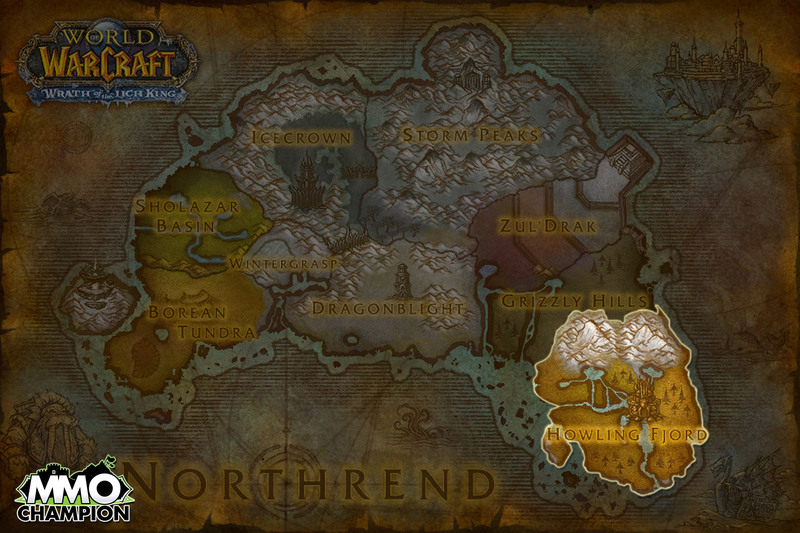 This is the only region in Northrend dominated by humans and dwarves. That is entirely because of Valgarde, however — without that city it would be an even match between the dwarves in the region and the Drakkari and the furbolgs. No one is factored the murlocs in, either, mainly because they don't let most people close enough to count them. Almost everyone lives in Valgarde. The exceptions are the farmers, who have their thickwalled farmhouses by their fields, and the hunters and trappers, who live in small camps among the trees and come south only to trade or sell. This region is also the only Alliance-dominated part of Northrend, and here the Drakkari and even the furbolgs are the ones at risk. Map of the Howling Fjord in Lands of Mystery. The north edge of the Fjord has low hills and thick forest. The land smoothes out to the south, however, and the trees fade back, to be replaced by grain and a few hardy fruits and vegetables. Daggercap Bay dominates the southern end, which is all rock. Most people live in Valgarde or in a semicircle above it. The fjord has its share of wildlife. Bears, wolves and other creatures prowl the forests, and small animals sneak through the farmland as well. Birds roost in the trees and steal grain and seeds, and the warmer climate and rich soil draws insects and other vermin as well. The Howling Fjord has only one major settlement, and that is Valgarde. Everyone else lives in isolated farmhouses or small hunting camps. Even the Drakkari and the furbolg wander down from the Grizzly Hills or Zul'Drak and set up hasty camps among the trees. As the name indicates, the Howling Fjord is inspired by the Norwegian fjords. Among the creatures concepted for the area were the Fjord Giants. Howling Fjord in Warcraft III. The dock at Valgarde, where Alliance players arrive when taking the boat from Menethil Harbor. Valgarde, the main Alliance town in the zone. Daggercap Bay, the bay outside Valgarde. Westguard Keep, a dwarven town. Vengeance Landing, the small settlement Horde players arrive at when taking the zeppelin from Tirisfal Glades. New Agamand, the main Horde base in the Howling Fjord, held by the Forsaken. Westguard Keep, an Alliance settlement in the north. A bridge to Wintergarde Keep a small Alliance settlement in the northeastern mountains. An island in the Howling Fjord, possibly in Lake Cauldros. A vrykul settlement near Valgarde. Ember Clutch, a scorched part of the zone with hovering dragons. Note the new flame effects. A forest in the Howling Fjord. Official artwork image of what appears to be a vrykul building located in the cave close to Valgarde. Official artwork image of the wrecked ship found close to Valgarde. Official artwork image of a vrykul harpoon-launcher. Official artwork image of Nifflevar. Concept art of a mountain glacier above Howling Fjord, autumn version. Howling Fjord concept art - possibly Whisper Gulch. Concept art of a mountain glacier above Howling Fjord. Concept art of Utgarde Keep, the structure which houses the instances in Howling Fjord. Concept art of a vrykul building. Patch 7.3.5 (2018-01-16): Level scaling implemented, previous zone level: 68 - 72. ^ a b c "The Scourge of Lordaeron: The Shores of Northrend", Warcraft III: Reign of Chaos. Blizzard Entertainment. This page was last edited on 30 March 2019, at 16:57.